The RED Trio is a free-jazz group based in Lisbon, made up of Rodrigo Pinheiro on piano, Hernani Faustino on bass and Gabriel Ferrandini on drums and percussion. 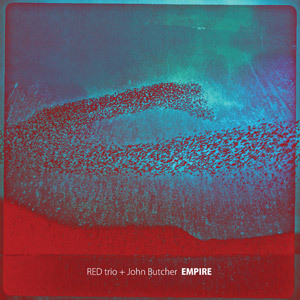 For their second album they had the good fortune to welcome a special guest, British saxophonist John Butcher, a revered figure in the European free-improvisation scene. This collaboration works very well, through an album of increasingly lengthy tracks, the group melds its musical minds to collectively explore the far reaches of free-jazz and improvised music. On the first track, “Sustained,” they begin with an abstract probing of the musical realm, gaining speed and power from growling saxophone and strong drumming, then making way for a great free piano trio section. “Pachyderm” opens with long tones of saxophone over ominous sounding bowed bass, creating eerie, haunted tones. Butcher’s saxophone nibbles and pecks during a dialogue with Ferrandini’s percussion, before the band fills into a fast and exciting collective improvisation. The group builds an explosive and fascinating sound collage, with searing long tones of saxophone over an abstract backdrop. Smears of sound return the band to the ominous and foreboding feel of the beginning of the improvisation, and they conclude in a patient and thoughtful manner. Clocking in at twenty-three minutes, “Empire” is an epic that begins in a slow, spacey manner. Spare abstractions of sound begin to coalesce as the drums strengthen around bowed bass and saxophone accents. Butcher sounds fantastic here, building a buzzing and cacophonous sound that reverberates with a rough sandpaper like tone and culminates in ferocious free-jazz squawks. Pinheiro takes a strong unaccompanied piano solo with bass and drums building back in before Butcher caps an extraordinary performance with a mix of high-pitched bird like saxophone and lower toned blasts of air. The group all comes together to conclude the performance with a fast section of collective free improvisation. This was a very exciting and challenging album that was very rewarding. The presence of a veteran musician like Butcher was able to push the trio into new areas of exploration, and they in turn were able to offer a welcoming atmosphere for the saxophonist to shine. 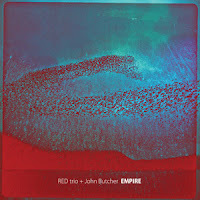 Empire - NoBusiness Records.